If your family is anything like mine, bananas are either gone in a day or sitting for a week. When I find myself with a bunch of overripe bananas, I reach for my trusty banana bread with Splenda recipe. But what if you want to change it up? 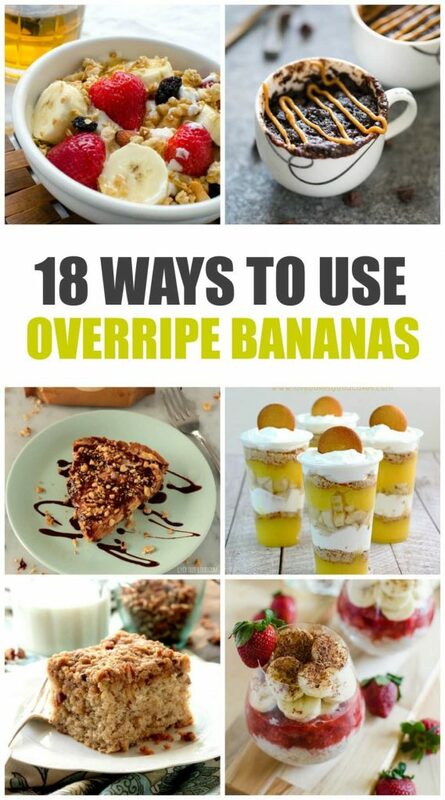 Today, I’m sharing 18 ways to use overripe bananas for those times when banana bread isn’t hitting the spot. Lately, I’ve been slicing bananas and adding them to oatmeal with a little cinnamon and nutmeg for a hearty breakfast and it’s great for ripe or just past bananas. But for those times when we just let them go too far, it’s nice to have other options. Whether you want to try banana stuffed french toast, make banana oatmeal chocolate chip cookies, or pop a tasty mug cake in the microwave, this list has something for everyone to enjoy! Not sure you are ready to use those bananas just yet? Peel them and throw them in a freezer bag for later! Use them frozen in a smoothie or thaw them out for your recipe. Boom. No more waste. Anyone else getting hungry? What are your favorite ways to use overripe bananas? Share in the comments below! See what else we’re cooking up with these tasty recipes for breakfast, lunch and dinner! If you shop through my advertising, you help keep this site afloat. Thank you! Thank you for including our Banana Fritters in this delicious round-up! That Banana Pecan cake sounds to die for! It really does! Everything is making me hungry :). Thanks for stopping by! I need to hold on to this list, the ripeness threshold for me is pretty low! 😉 Thanks so much for sharing my peanut butter banana cream pie, have a great rest of the week!